I'd been saving up to have the doglegs repaired, so when I found I needed to have the bulkhead done too I decided to get everything done in one go. I'd already got two quotes about a year ago for the doglegs, so I knew what kind of cost I was looking at. I wanted to use a chap I know who is a specialist classic car restorer. He gets all his business via word of mouth and you can see why, I've visited his garage a lot and am always amazed at the quality of work which he achieves. Luckily he managed to slot my little B into his busy schedule, but I still had a 2 month wait before it could go in. 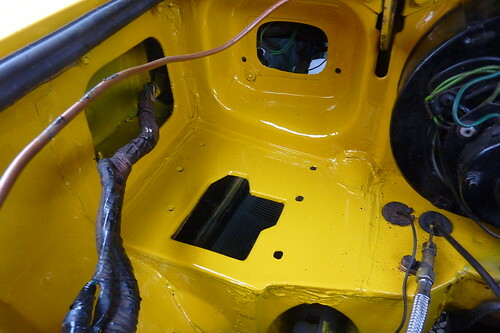 I was really nervous as the week ticked along as I was aware that the rust could well have progressed from the doglegs into the inner sill and I could be looking at a huge bill. I'd asked the garage to let me know if we were pushing the estimate but you still manage to worry! The mid-week call put my mind at rest and the final bill just edged over the original estimate due to the complexity of the bulkhead repair (all those curves and shapes) and the need for extra paint coats (as yellow doesn't really cover too well). The final result was fantastic, it was great to see the doglegs back to how they should be, and they'd even managed to get rid of an annoying patch of rust above it where the seatbelt must have chipped the paint at some point. It turned out the rust had actually made it into the inner sill, but hadn't progressed too far. Thankfully they were able to make good with a new section - this is probably the bit I'm most happy about; knowing that sill is in good nick puts a big doubt out of my mind. The bulkhead repair was even more impressive. They'd had to cut out more than we'd expected to get to solid metal - you can see in the photos that the curved section next to the bonnet bracket had to be removed. Looks so good now its a shame to put the pedal box on it.